Senator the Hon. Simon Birmingham, Minister for Education & Training, will launch South Australia’s first P-TECH School in northern Adelaide as part of the Australian Government’s expansion of it’s innovation and science agenda. St Patrick’s Technical College, in partnership with the Defence Teaming Centre, will become South Australia’s first P-TECH school in 2017, part of a $4.3 million initiative. The P-TECH Industry Launch is your opportunity to learn more about this $4.3 million initiative, the benefits for local industry and how local employers can be directly involved from the very start of the program. 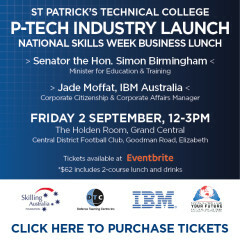 The event is held in conjunction with St Patrick’s Technical College’s annual National Skills Week Business Lunch. The first P-TECH school was established in the US by IBM in 2011 in collaboration with the New York City Department of Education, The City University of New York, and the New York City College of Technology. The first two Australian pilot sites in Ballarat and Geelong commenced in January 2016. This entry was posted in Industry Office, Latest News on 22/08/2016 by St Patrick's Technical College.